B﻿ounty includes second known example of a repeating burst. ﻿In early testing during July and August, before it began full operations, CHIME spotted 13 FRBs. Prior to this, astronomers had between 50 and 60 examples. CHIME has also ﻿detected the lowest-frequency FRB known so far, Good said. It appeared at wavelengths of 400 megahertz, breaking the previous record of 700 megahertz. Previous hunts with other telescopes had not found any FRBs at these lower wavelengths. 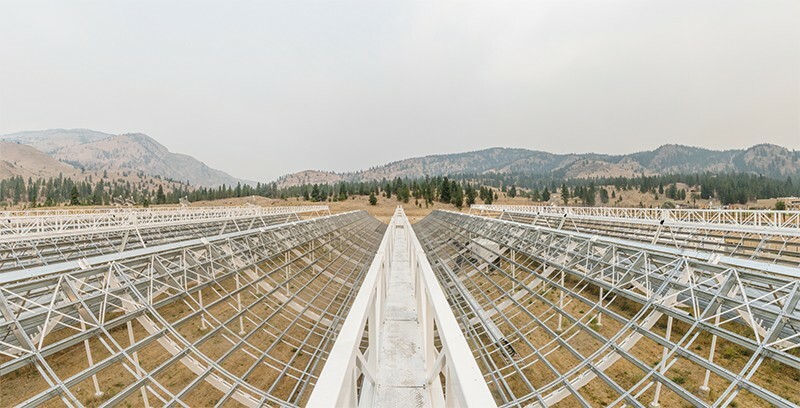 The CHIME observatory﻿ is located outside Penticton, British Columbia. It consists of four 100-metre-long, semi-cylindrical antennas that look like a half-pipe for snowboarding. The facility operates around the clock and scans the entire northern sky each day — giving it an excellent shot at catching transient FRBs. The bounty of detections came when the instrument was not yet at its full sensitivity, which suggests that it could eventually spot as many as dozens of FRBs each day. Good said the findings will appear in ﻿Nature on 9 January. Additional reporting by Elizabeth Gibney. Correction 07 January 2019: The original version of the story misstated the frequency of the lowest-frequence fast radio burst known as millihertz instead of megahertz. Lorimer, D. R., Bailes, M., McLaughlin, M. A., Narkevic, D. J. & Crawford, F. Science 318, 777–780 (2007). Spitler, L. G. et al. Nature 531, 202–205 (2016). Chatterjee, S. et al. Nature 541, 58–61 (2017).